You could argue that learner drivers shouldn’t be driving down Swanston St! Actually Jon, you could argue that learner drivers absolutely should be driving down Swanston St (the part with cars, and under competent supervision!) – because learners need to gain experience with complex traffic situations. The lights here have gone through a few iterations. A decade ago they were similar to this but only had the one light for straight-ahead traffic (from when taxis and then private cars were permitted under some conditions). But IIRC the lights from the early 1990s, when the street was first closed to cars, just had a straight-ahead light for bicycles and a separate T lamp that came on for that phase only (like the one you can see on the top in the current photo). Actually yes, I just saw Ben’s comment – the full set of stop-go lights for trams were indeed present a decade ago as well. I don’t precisely recall, but I presume the straight-ahead traffic light would have just stayed red in the daytime as cars were only permitted at night – hence the need for the separate green bicycle. I like the red light facing cyclists in Vienna, where the cyclist has one foot on the ground. Everyone with a drivers license knows that T is for trams and the bike symbol is fr bikes only. So that only leaves the two arrows for all other traffic. 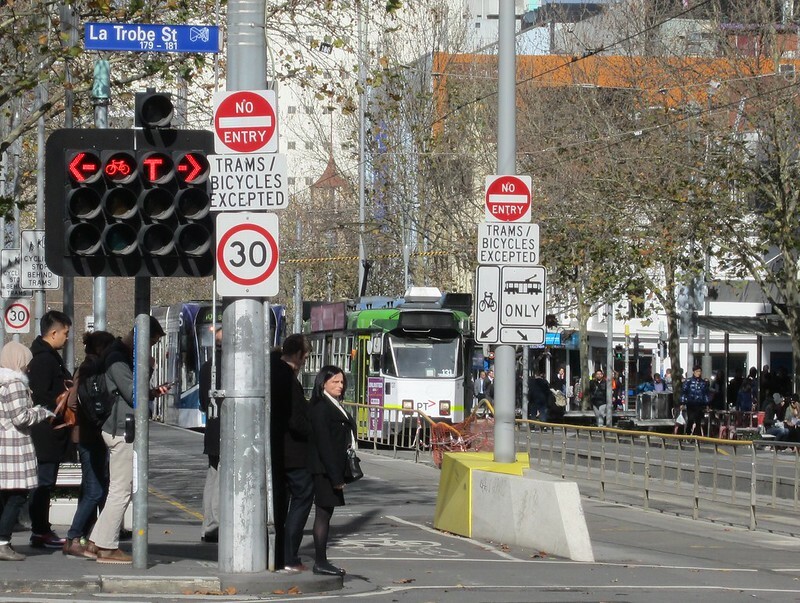 @Ben & Tony – Alternatively, you could argue no cars or trucks should be driving down Swanston Street except emergency vehicles and trams. It is now pretty clear that the pedestrianised sections of the street have been a huge success. Time for the whole street from Franklin Street to Flinders Street to get the same treatment.